When trying to pick among competing steam iron models, your main focus should be on two features: steam power and pressure. Everything else is gravy. Seriously. If the steam iron you end up buying does a poor job of delivering steam and pressure, you just wasted your money. It really all boils down to that. Steam power and pressure are non-negotiable. 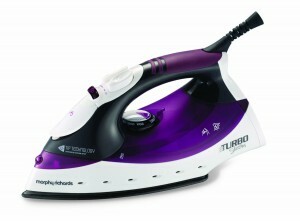 The good news with the Morphy Richards Turbosteam 40699 Steam Iron is that it can produce a decent volume of steam. However, if your ironing jobs normally involve very difficult fabrics or really deep creases, you might want to pick a more heavy duty Morphy Richards model. While the 40699 does a decent job, it can only tackle limited jobs like a few clothes at a time. If you see yourself ironing huge loads of clothes or ironing for long stretches of time, this might not be the Morphy Richards unit for you. You might want to look for models which have a detachable tank. Another issue you need to pay attention to regarding this model is heating time. If you are the type of person who will set aside a fixed block of time to steam iron your clothes, you should be fine. However, if you have a hectic and erratic schedule where you have to rush out the door more often than not, the heating time requirement of this model might be inconvenient for you. 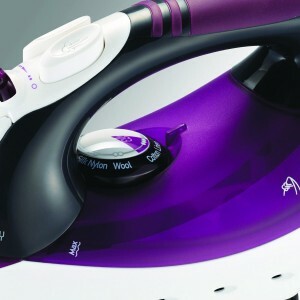 Morphy Richards models have made quite an impression among steam iron users the world over because of their heavy pressure capabilities and large steam production volumes. Well, if you are looking for such breakaway steam production power from this unit, you are looking at the wrong unit. This model is a ‘lite’ version of the steam production behemoths Morphy Richards is known for. Don’t get me wrong, this unit produces decent steam at 120g and even has ‘Tip Technology’ to handle stubborn creases. However, despite these features, it is on the light end of steam ironing capabilities when compared to other more robust Morphy Richards models. If you have light ironing loads and you have the time to let this unit heat up properly, you should be fine. However, if you typically have heavy ironing loads or you find yourself having to get out of the house as quickly as possible, this might not be the iron for you. It may take too long to heat up or the steam volume might not be enough for your needs. Water tank capacity directly impacts how long you can iron in one sitting. If you are a very busy person, you probably want to iron your complete load in one go. This is where tank capacity comes in. If you want to knock out big ironing loads, you need to iron for a long continuous stretch. This is only possible if your steam iron has a very large capacity tank. You can iron for a long time without having to refill the tank. The problem with the Morphy Richards Turbosteam 40699 Steam Iron is its tank is only 400ml large. For most people, this should be enough. However, if you find yourself ironing huge loads or your fabrics tend to have large surfaces, you might find yourself stopping and reloading. This can disrupt your flow and reduce your productivity. However, if you have light loads it’s fine. Assuming you can handle its relatively slow heating. As mentioned above, your primary considerations when comparing different steam iron models should be stream volume and pressure. However, following closely behind should be how easy it is to hold, use, and handle the device. Thanks to the 40699’s diamond surface, moving a steam iron over a creased surface or even heavy uneven fabric is quite easy. This is a very important consideration because you don’t want to tire out when making passes over a piece of fabric. The more passes or repetitions you have to do, the easier it is for you to tire out. This can dramatically decrease your productivity. This can also make ironing a major hassle you’d rather avoid. This units Diamond surface makes smoothing out fabric surfaces a friction-free affair. 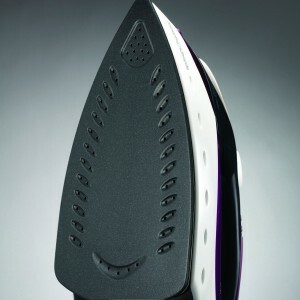 Since your iron glides over the fabric you’re ironing, you’re not prone to get tired. The iron doesn’t feel heavy. You are able to do more. While ironing is not exactly a preferred activity for most people, this unit’s Diamond surface does make the time go by faster. As mentioned above, the slow warmup time of this device can be a serious problem. If you are very busy, you might want to opt for a much hotter and faster Morphy Richards unit then the Turbosteam 40699 Steam Iron. Unfortunately, besides the temperature and tank capacity issues mentioned above, other drawbacks to this model include: no auto-shut off and short cord. 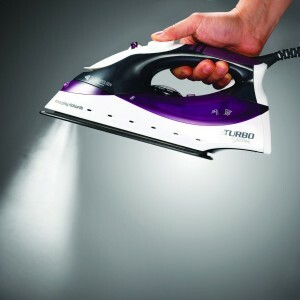 Auto-shutoff is fast becoming an almost indispensable feature for steam irons. If you get distracted by a phone call in the middle of ironing, you might leave your iron unattended on the fabric you’re working on. This can be a serious problem. Forget about burning the fabric, leaving a hot iron on while you’re on the phone or after you’ve gone into another room can lead to a serious fire hazard. Auto-shutoff takes care of this issue. The iron shuts off after a certain amount of time if it detects no action or movement. This can be a lifesaver. If you want your ironing experience to be a pleasant one, you have to have maximum range of motion. The more latitude you have, the easier it is for you to position the iron the right way to smooth out surfaces as quickly and as efficiently as possible. If you have a short cord, your range of motion might be limited and ironing can be awkward and inconvenient. There is no such thing as a perfect steam iron nor is there such a thing as a completely bad steam iron. Your choice should focus solely on your needs and the circumstances you find yourself in when using it. Use those considerations when picking a steam iron.